Posted bySareesh Sudhakaran	 January 31, 2014 May 15, 2016 5 Comments on Do you Need a 4K TV or 8K TV in your Home, Office or Studio? By the time you finish reading this article somebody somewhere will have bought an Ultra HD or 4K TV. There’s a lot of confusion going around on whether a 4K TV is relevent in the common home, office or studio. This article looks at the scenarios in which Ultra HD is worth the trouble. in a year. Sony has announced a 4K recording mobile camera and a 4K Short Throw Projector; and Youtube allows everyone to upload 4K videos for free. Whether you like it or not, 4K TVs are here, and more are coming. Even though my focus is to get as scientific as possible, I’d bet that, if your neighbor bought one, you need one too. Now let’s see if you need to feel guilty about it. Do you need a 4K TV? All things being equal, 4K is twice the resolution of 1080p (in one dimension). 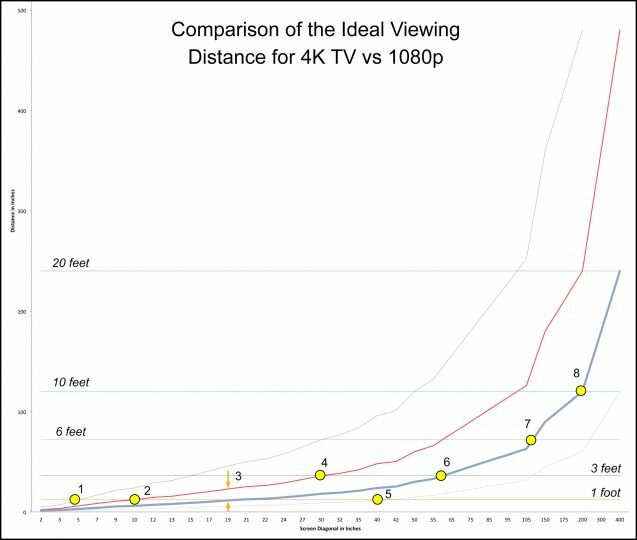 This automatically means, the furthest viewing distance for 4K is the ideal distance for 1080p; and the closest distance for 1080p is the ideal position for 4K. 1 – At 5″ and less, even 1080p is more than what the eye is capable of seeing, so 4K is wasted. 2 – At 10″, a 1080p screen will allow you to view it at a distance of 5″, which hardly anyone ever does. However, it is likely that you might watch the screen at a distance greater than one feet. In this case, 4K is wasted. 3 – This is funny, because the width as shown by the arrows signifies a distance of one foot. A common human head is about 9″ in diameter. If you tilt your head, or bend forwards or backwards, you are still in this ‘zone’. A 19″ 1080p screen will allow you to watch at 1 foot, with a viewing angle of 150o. Even at 19″, then, 4K is wasted. I think, no matter where you sit, you must allow for at least a distance of 18″ (two heads) for the extra resolution to make some impact. This, we get in number 4. 4 – At this distance, the difference between 4K and 1080p is 18″. At 1080p, the ideal distance is at 3 feet. If you replaced the 1080p TV with a 4K TV, you can easily watch from 1 foot away, at an angle of 160o. 1080p has the advantage here, because you can go back to about 6 feet. E.g., at 4 feet, the viewing angle is 115o, which is still fairly wide. Therefore, even with a 30″ screen 4K has no indubitable benefits. This is probably why 4K TVs start at 32″. 5 – With a 40″ TV, you can watch both 1080p and 4K at 3 feet. The advantage to 4K is, you can come closer to 1 foot if you wanted to. At a distance of about 4 feet, you’d get the same resolution as a 1080p screen. Here, you can begin to see that 4K has an advantage. 6 – With a 65″ TV, you can’t go closer than 3 feet with 1080p, but with 4K you can go to almost a foot. On the other hand, you can also comfortably watch at 6 feet and still get a full 1080p experience. I consider the range from 32″ to 65″ a grey area where you really can’t pronounce 4K has an advantage that commands a price premium. However, if you can afford it, then, in absolute terms, 4K is better than 1080p. 7 – At 105″, a 1080p screen will force you to sit at a minimum distance of 6 feet, while the ideal distance is about 10 feet. A 105″ 4K TV will let you sit at 6 feet and have an immersive experience, and your kids can still go to about 3 feet. 8 – With a 200″ home theater screen, the ideal distance for 4K is an excellent 10 feet, and you can sit closer, to up to 6 feet. 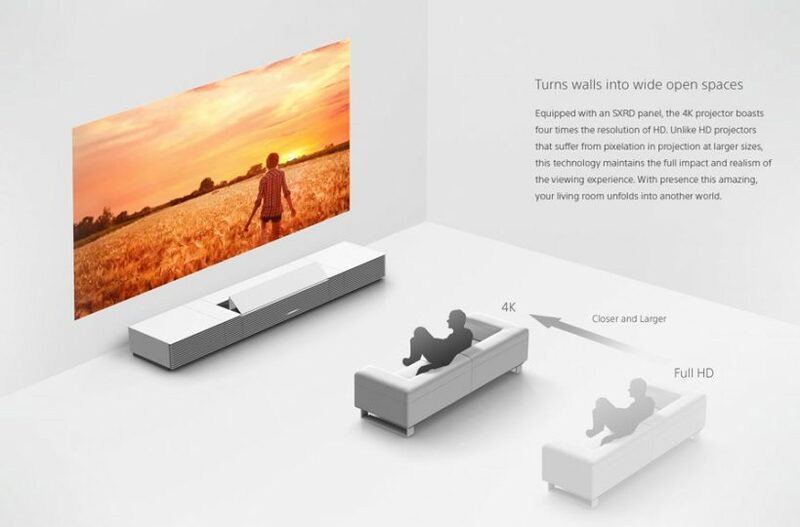 You can also extend the seating to 20 feet and still enjoy the 4K experience. On the other hand, a 1080p screen would demand a larger room (as we saw in our calculation of the ideal 1080p home theater room). 4K is the clear winner here. 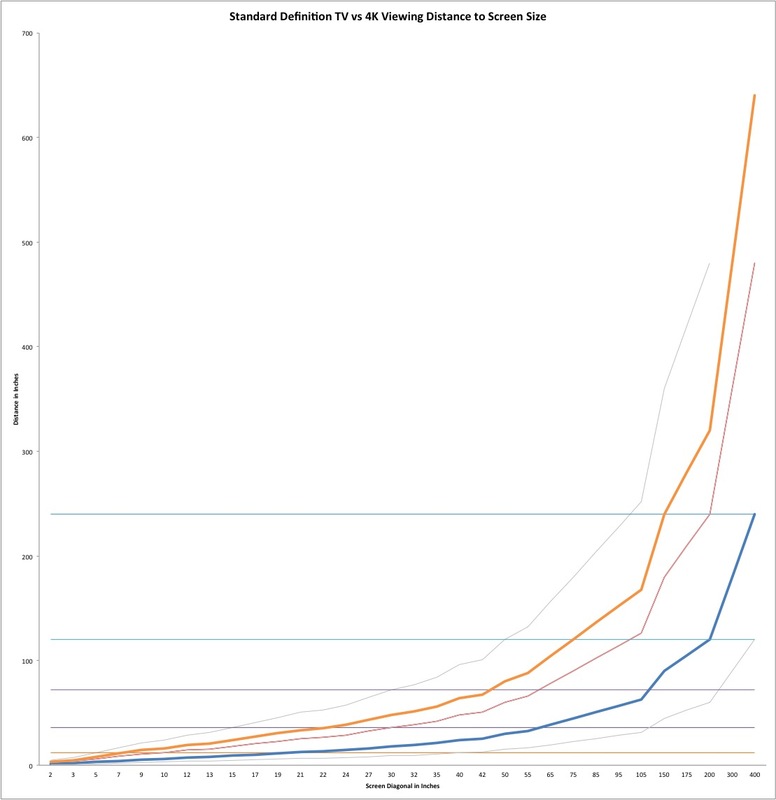 Take a careful look at the graph again. If you step back from a 4K TV, at worst you have an excellent 1080p TV. The great advantage of 4K lies in the fact that you can get closer, so you can have a bigger TV in a smaller room. You only need a 4K TV if it is greater than 65″. For anything below this size, 1080p is good enough. However, if your room is small and you prefer sitting closer, or prefer using the display as a computer monitor (which includes reading text), a 4K TV will be easier on your eyes. For sizes greater than 65″, 4K TVs allow you to watch a bigger screen from closer, for a better experience, in a smaller room, while at the same time maintaining all the advantages of a 1080p screen. It’s a no brainer really. 4K does not hinder in any way, but will allow you to get closer, regardless of the size. If I had to write one rule of thumb to follow, it’d be this: 4K is good for sizes 32″ and above. This means practically any television for home viewing, really. But wait, we’re not done yet. We have three scenarios to cover. I shouldn’t have got your hopes up. As you can see, SD can be watched on a 1080p screen, but you’ll hate getting closer. However, there is no point at which standard definition enters the 4K zone. This won’t affect you if you sit further away (at 1080p distances at least). But, it will never allow you to sit closer. 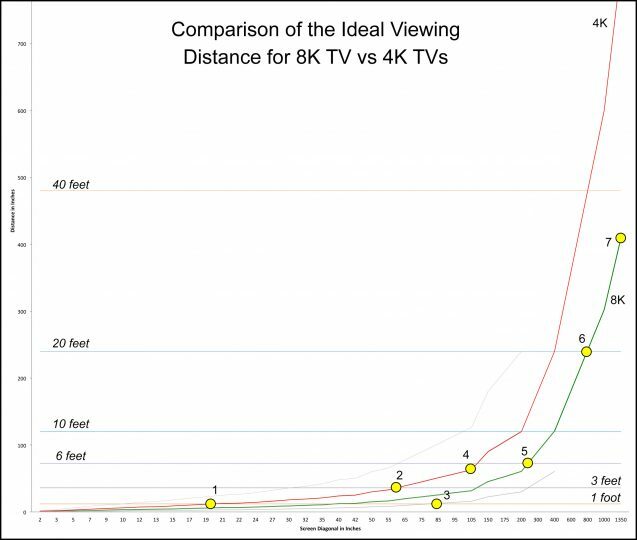 Even uprezzed SD to 4K will be almost unwatchable at normal home viewing distances. You placed your couch based on the ideal distance for 4K TVs, and now you have to go three times as far? It gets worse. Most broadcast HD content is still 720p, which is somewhere between 1080p and SD. Just because your channel calls itself ‘HD’ doesn’t mean it’s 1080p. The writing is on the wall. Don’t plan on watching standard definition or 720p content on your 4K TV. Unfortunately, this means 90% of broadcast. And we haven’t even covered ‘regular’ 1080p content yet. If you only plan on watching Blu-rays and 1080p TV, then 4K is pointless. That means….you can only see any benefit with 4K TVs if you actually watch 4K content. If you’re monitoring 1080p content, having a 4K TV is useless. On the other hand, if you’re monitoring 4K content, a 4K TV is handy. 32″ is an excellent balance between the size and weight of the monitor and the viewing distance (2-3 feet). In any event, I wouldn’t go over 42″ for monitoring purposes, since you can’t get closer than one foot. You could go larger, but that would be sheer vanity over any practical necessity. Watching dailies, of course, will be a pleasurable experience on larger 4K television screens. You can display 8-9 MP images on a 4K TV. Unfortunately, the ‘pixel-peeping’ distance (about one foot) stops at 42″ or thereabouts. This is the approximate equivalent of a 20″ x 36″ print. But only in size, mind you. If you plan on displaying a 105″ image, your pixel-peeping audience must be barricaded away at a minimum distance of 3 feet. Not bad, but a fine art print will still out-resolve the 105″ (51″ x 91″) 4K TV. Why so? A fine art print can have a print resolution of 360/720ppi. A 105″ 4K TV only has a ppi of 42. At what screen diagonal will we get 300 ppi? 15″. Ouch. If you plan to watch broadcast television, old tapes, Internet 1080p content, DVDs, etc., – at all – a 4K TV will be painful. Stick to 1080p HDTVs for now. Buy a 4K TV only if you plan on watching 4K content. A few downloaded movies or 4K Youtube doesn’t count. The rest of the time, when you’re not watching 4K content, your TV will give you grief. If you want the ultimate home theater experience with 4K content, even a 32″ 4K TV will show some benefits over 1080p. At 105″, it is stellar. Stick to 32″ for on-set monitoring of 4K content, and no larger – unless you are watching dailies, that is. 4K TVs won’t outdo prints for fine art displays. You want an even more bottomed out answer? Here it is: If you want to enjoy the ultimate home theater experience, and have access to good 4K content, then 4K TVs 65″ and above are great. For everybody else there’s 1080p. Do you need an 8K TV? We have seen under what conditions 4K makes (no) sense. 8K makes no sense either because there isn’t any 8K content yet. By 2020, things might change. 1 – Until this point (19″), 8K will only be useful if you’re watching at less than one foot. 3 – At 85″, you’ll hit the limit for pixel peepers. An 85″ 8K TV is the equivalent of a 42″ x 72″ print at 30 MP. I believe you could stretch it to 105″. This gives you a ppi of 84. Still nowhere near print resolutions. 4 – At 105″, you’ll be sitting 3 feet away for a viewing angle of 165o. You can move closer to 1 foot, and that gives you the an immersive experience. Therefore, 8K would be worth it after this point. 5 – At 250″, the ideal distance is at 6 feet, and this too makes it a great immersive experience. The viewing angle is approximately 165o. 6 – With an 800″ screen (roughly 60 feet screen horizontal), a viewer can sit at 20 feet (that’s almost front row!) and get an immersive experience at a viewing angle of about 165o. 7 – A 100 foot screen will allow you to sit at 30 feet, making cinema theaters smaller. Between 600″ and 1,350″, we have an IMAX (equivalent to 70mm film, not digital) experience. If you’ve ever seen IMAX film in a dome theater, you’ll know what I mean. Obviously, 8K doesn’t make sense for anything below 42″. You could use it for fine art photographs at 42″ to 105″, but don’t expect them to be better or cheaper than printing. Ultimately, the advantage of 8K TV is that it will give you an even better home theater experience than 4K, in a smaller space. The major problem is, movies aren’t mastered above 4K (hardly any are mastered even at 4K). Therefore, I can say categorically that you won’t be seeing 8K home theater systems any time soon. Where 8K really shines is on large screens. In cinema, 8K is capable of producing IMAX-like content, and that is definitely worth all the trouble 8K brings. It would reestablish cinema as a unique experience. 8K is great for large screens (15 feet+) in small spaces, mainly installations, advertising, trade events and of course, cinema. It is not great for stadiums and billboards because the viewing distances are large. It is great for displaying fine art still images, but isn’t better or cheaper than prints. It is wrong of people to say 4K and 8K have no uses. It does. The downside is that we don’t have 4K and 8K content – it’s like owning a Ferrari but there’s no gas to run it. If you’re watching 4K content, get a 4K TV. 4K is better than 1080p, even for home viewing – at sizes 32″ and greater. Let me put it another way – the world needs 4K TV. Every application, from security cameras to movies to wedding videos will benefit from 4K. I have no doubt about this anymore. The home belongs to 4K, period. 8K should definitely become the standard for cinema. It would rock, and also reinvent the language of cinema. 8K is okay for fine art photographers who need to display multiple images when space is a problem. But it will not replace large prints. This is what I see. What do you think? 8K anytime soon? i think your calculator is broken – enter the 3 inputs and nothing calculates..
Pierwalker Thank you! I don’t think 16K will make a difference for cinema and broadcast, though it is a useful idea for virtual reality, where the screen is very close to your eyes. BTW, this IBC, NHK will demonstrate a new 8K TV. It’s coming soon, all right. 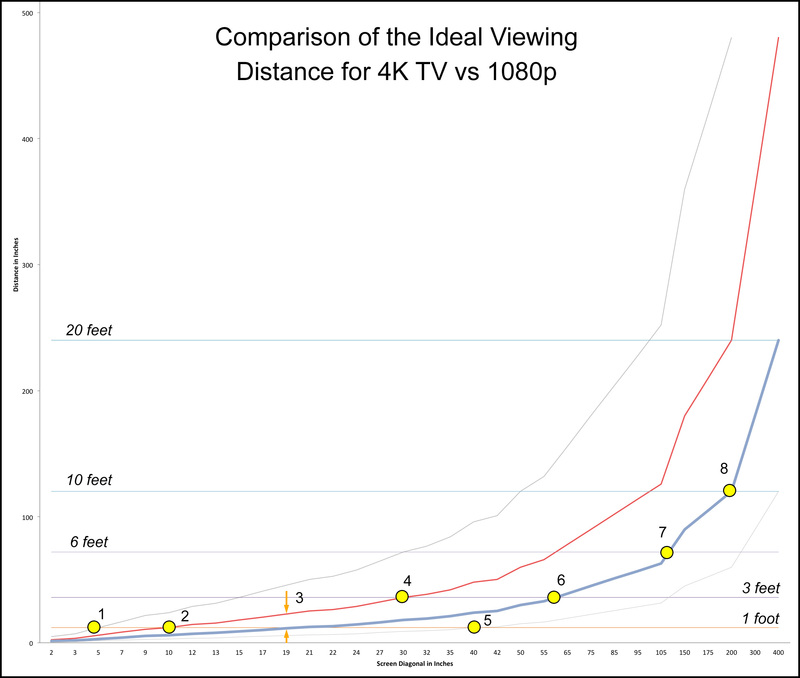 Really enjoyed reading about the reccommended optimum viewing distances for TVs of various resolutions in your article. I do wonder, though, if the average home’s room dimensions will ever enable many people to really make a 8K TV a practical proposition. I suspect 4K will be fine for most people. But then who knows? I have just read a rumour that following on from 8K, 16K is being developed! I think I’ll need new spectacle to benefit from one of those! 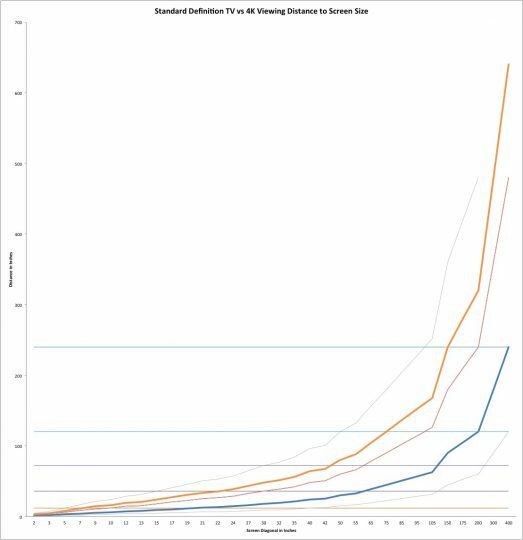 I wonder how your charts will look once you’ve added that format! Very interesting thought. And a very interesting and informative article, by the way. ilclista Rec 2020 is a theoretical color space that does not exist on consumer or professional displays yet. Are there even 4k TVs on the market that can display in rec. 2020 right now? I’ve heard most of the 4k TVs are still using rec. 709…is this true? If so then what is the point of getting one until you can take advantage of the 4k color gamut?